My current Idea is to make a game where you play as one of the chess pieces (for example as the queen, with other pieces the freedom of movement would be more limited). You can talk to the other pieces and you can discuss who should move. Sometimes this can be very hard, for example when you try to convince another piece to kill itself only to save you. The setting leads to some interesting questions: When do you win? Do you still count it as winning if you will live but your king is dead? Our will you sacrifice yourself so the king can live? Or maybe you can convice your oppenent to make peace? Maybe you can kill you own king to save everyone else in your team? The whole game will take place on a standard chess board with the standard chess figures. You won't be able to move free. You will always be presented with a bunch of options you can choose from (examples: "Sacrifice the pawn next to you" or "Go three steps left"), but the options will depend on your choices in the dialoges before. After your decision it's time for the enemy to move too, so it's kinda turn based like real chess. 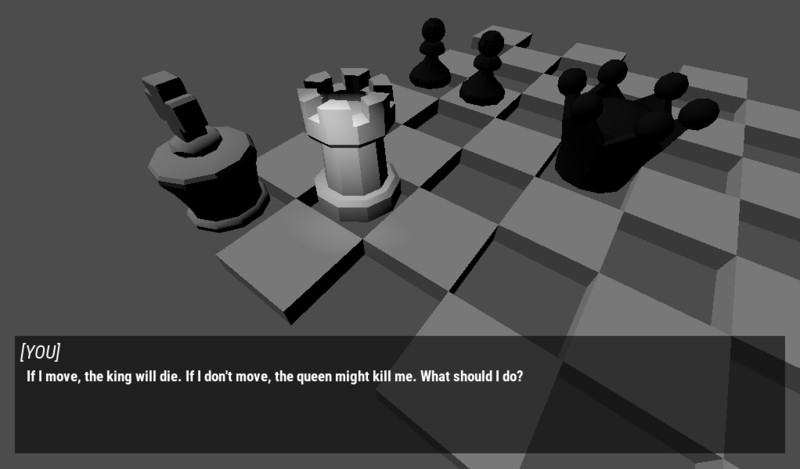 Currently I use the Low Poly Chess Assets made by Devil's Garage (https://itch.io/t/211792/free-chess-game-assets-3d-low-poly-pack), but for the finaly version I will make my own high poly chess pieces (I plan to rig them so that they can show "emotions" by deforming themselfes). Some chess rules won't be taken into account. For example it is possible to move if you are the player between the king and an enemy. You will sacrifice your king then. The complete decision tree of the game is stored as JSON file. So it is very easy to create new scenarios without writing a single line of code.